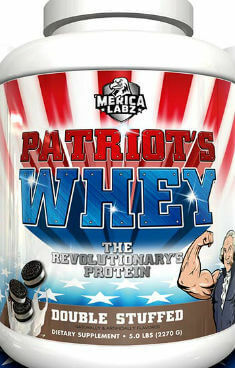 Coming from the most patriotic supplement brand ever, comes Patriot’s Whey. Following the introduction of their pre-workout stack and test booster, Merica Labz is now venturing into the crowded protein category. As you will learn in our Merica Labz Patriot’s Whey review, The company went beyond a cool name and great packaging to try and make their protein standout from the crowd. Coming to you in 3, patriotic flavors (the names are just great!) and a real innovative approach. Ready? Listen, this protein powder, has real marshmallow and Oreo pieces in it in it.REAL pieces. How do you feel now America?! Nutrition Profile – 142-153 calories, 25g Protein, 5-6g carbs, 2.5-4g fat. Pretty standard label. All ingredients are in their average for the category. One thing to note is that if you are lactose sensitive then this is not the whey for you. 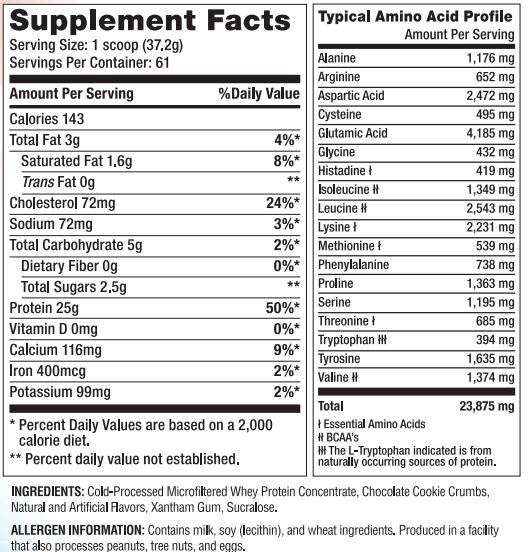 And, yeah a bit heavy on the calories and sugar compared to what has become the standard profile for protein powders. But with all these goodies inside, it sounds like it is totally worth the extra 20 calories! Since Merica Labz took the whole American thing to the extreme with their product naming (red, white & boom? ), you should expect the fun to start here. First off, you have the Double Stuffed which has real Oreo cookie pieces. Second you get the Fortuitous Keepsakes with Lucky Charms marshmallows in it and to finish off we have the Yosemite S’mores with real chocolate chips and marshmallows. Yeah, we know! These all sound too good to be in a protein powder. Merica Labz Patriot’s Whey is listed at $59.99 for a 5LB tub which brings in 61 servings .This is on the high side if you are comparing this product to other protein concentrate alternatives, but, frankly with this flavor profile, you probably shouldn’t. You are clearly paying a premium for what are some of the most innovative flavors we’ve seen. Obviously, the best way to find the best Patriot’s Whey prices and hot deals is to use our price comparison engine and sign up to deal alerts. Merica Labz is continuing in their American journey. And, one can only admire their approach and consistency with not only the branding side, but continuing to innovate, even in categories that you would think have seen it all. Patriot’s Whey is a super cool product which is going to make your protein exprience GREAT AGAIN!